Chester Tourist - Hotels, Accommodation in Chester, Cheshire, U.K.
Our Chester Central Bridge Street hotel is in a prime location in the heart of Chester, and makes a great base for exploring this picturesque walled city. The Grosvenor Shopping Centre is just a hop across the road and there’s plenty of food and drink choices in the adjacent new restaurant development. Within walking distance of the Chester city walls, the stunning Chester Cathedral and the University of Chester’s Riverside Campus, there’s plenty to see and do. The must-see Chester Roman Amphitheatre was Britain’s largest and is only a 4 minute walk from our hotel. Our on-site Bar Café serves our unlimited breakfast and tasty evening meals. Brand new modern hotel situated just outside the main shopping streets of Chester overlooking Chester Racecourse. This circular glass panelled hotel boasts its own underground car park cafe bar and restaurant. About a ten minute walk to Chester Cross at the centre of Chester. This well established budget hotel is located outside the city walls a few minutes walk from Chester Railway Station. No On-Site parking. Parking is a few minutes away at a near by NCP Car Park. Recent £3m Refurbishment program. The New Blossoms Hotel is Chester's Oldest Hotel. There has been an Inn on the Blossoms Site since 1410. 67 individual experience in character bedrooms with many original features including leaded windows, architraving and cornices, several with views over the city. Our bedrooms come in all shapes and sizes from fabulous feature rooms and junior suites, to executive doubles and twin rooms. All have brand new bathrooms with smart and specious design. Situated in the very heart of the Medieval walled city of Chester The Blossoms Hotel's popularity dates back to the last century when visitors demanded elegant spacious accommodation. The same features remain today including high ceilings and a sweeping staircase. The Blossoms has a choice for dinning The Brookes Restaurant serving classical English and Continental dishes or you can relax in the bar and lounge for a lighter meal. Room service is available 24 hours a day. Also available are private dining rooms and banqueting facilities. Ideally located in the City Centre for all you shop-a-holics and for a great variety of restaurants and bars. Established in 1650 This upmarket hotel is located in Chester City Centre. This Hotel is located just outside the City Centre. Head for the M53 and come off at J12. Follow the signs for Chester City centre. You will be travelling along the A56. Keep going until you pass a Total service station on the left hand side. Take the first right after the traffic lights past the service station. Go down Ermine Road and then turn left at the bottom. You are now on Brook Lane. Go over the railway bridge and we are on the right hand side. This hotel is located just Outside of Chester. This luxury country house style Four Star AA Rated Hotel is located off the Broxton roundabout in the Cheshire countryside outside the city of Chester. The hotel is situated in its own grounds with its own golf course. This Hotel is located outside of Chester. Leave M56 at junction 15 M53 Leave M53 at junction 12 A56 Follow A56 Hoole Road towards city centre. The hotel is approx 1 mile from the motorway exit situated opposite 'All Saints' church. We are on the right hand side. Conveniently located within walking distance of the city centre and railway station and within 3 4 of a mile from the major motorway network. Our 20 en suite bedrooms are comfortably furnished and provide all the features you would expect from a modern hotel. Relax in this friendly family run hotel where you will find the emphasis on comfort and cleanliness where our staff will treat you as an individual and take time to meet your needs. No visit to Chester is complete without experiencing the Chester Grosvenor Hotel and Spa. Located right in the heart of the city, this historic hotel is ideal for exploring what Chester has to offer. Approaching Chester by car follow signs to Chester City Centre. Follow signs for Eastgate and Foregate which will bring you to the inner road and on to the one way system where you follow signs for City Centre Hotels. You will reach a barrier opposite the Town Hall and Cathedral. A permit will be issued to you and you can drive to the entrance of The Chester Grosvenor where your car will be greeted by the Concierge and your car will be parked. The Chester Grosvenor and Spa has adopted a non-smoking policy throughout the hotel and we have been awarded a Michelin Star for the 16th year. The Chester Grosvenor and Spa has invested £3M in the meeting and private dining facilities in 2007. The Westminster suite has undergone a twelve week refurbishment. Creating a flexible space perfect for conferences, seminars and private dining events. Located in the heart of the historic city of Chester within the Roman Walls and close proximity to Chester Cathedral and the famous shopping 'rows'. Eighty unique bedrooms that combine comfort with elegance. All are individually designed and air conditioned. The Grosvenor Spa offers the finest in spa facilities and treatments. There are five luxury treatment rooms and Thermal Suite comprising a salt grotto crystal steam room themed shower ice fountain herb sauna and foot spa. The Arkle Restaurant has held a Michelin Star for 15 consecutive years and offers classic French cuisine with a modern twist La Brasserie open all day for morning coffee lunch and dinner. This luxury Hotel is located in Chester City Centre by the Eastgate Clock. New Hotel, a beautiful Georgian house built in 1699 by lawyer John Mather. The hotel comprises of three floors with 18 rooms and a cellar dating back to the 1400's with parking facilities to the rear of the hotel. Located within the ancient City Walls in heart of historic Chester. From The M53 continue on the A55 follow signs for A483 Chester. Following ring road follow signs for A548 . Turn Left onto New Crane Street and we are on the left hand side. Please use Hotel car park on the right. 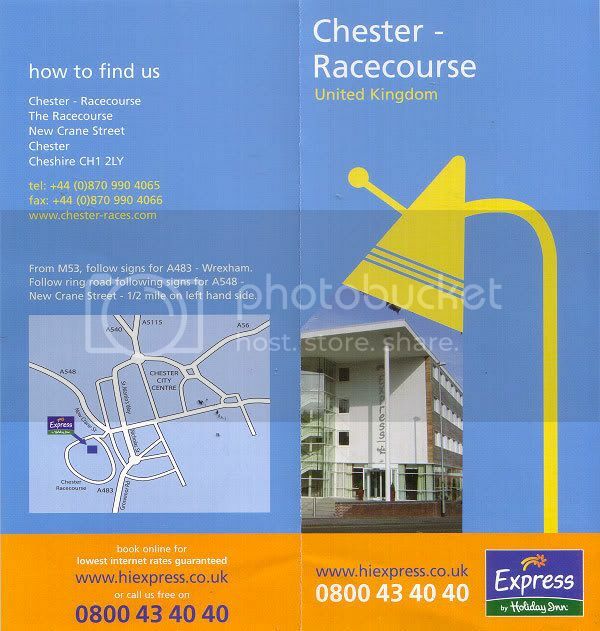 Express by Holiday Inn Chester Racecourse located in the grounds of Chester Racecourse and 500yrds from the centre of this historic City. At the hotel we offer 97 well appointed en suite rooms with power showers satellite TV direct dial telephone hair dryer and in house pay movie the hotel also has a bar lounge and dining area. The hotel has easy access to the M53 M56 and M6 motorways and a short driving distance of The John Lennon Airport Liverpool and Manchester International Airport Close by are the cities of Liverpool Manchester and close to Ellesmere Port and North Wales. Within minutes you can be immersed in the beautiful countryside of Cheshire and surrounding counties with places of interest such as Beeston Castle Stapeley Water Gardens Cholmondeley Castle Tatten Park The Blue Planet Aquarium Oulton Park Race Way Cheshire Oaks Designer Outlet Village and not forgetting the famous Chester Zoo. 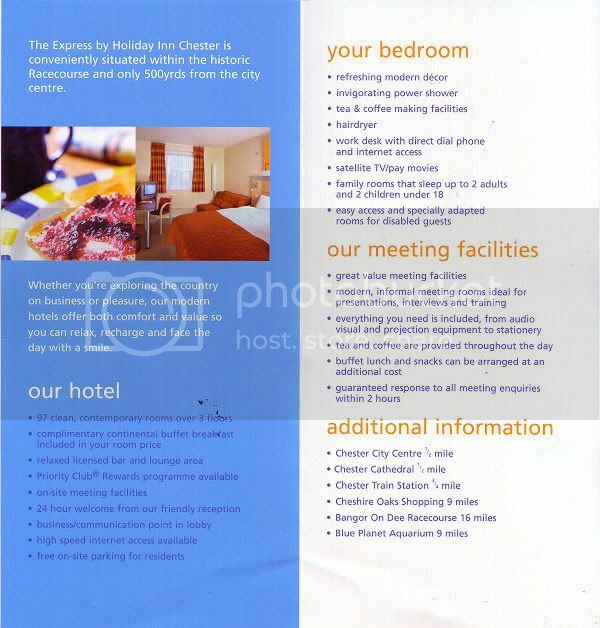 The Express by Holiday Inn Chester Racecourse is the ideal base for visiting. Chester's Newest hotel is located just outside the City Centre. 97 Bedrooms. Overlooking Chester Racecourse. Number of Parking Spaces: 600 The hotel uses the existing Racecourse Car park adjacent to the hotel. The car park is free to guests for the duration of their stay. With superb new decor throughout, three bars (including an exclusive residents Champagne and Cocktail bar) serving a quality selection of cask ales and whiskies plus International lagers totally exclusive to The Commercial Hotel, add into the mix our extensive selection of vodkas, rums, Champagnes, cocktails & wines. Our restaurant serves superb and extensive menu of quality home cooked food and daily specials as well as four 'five star' quality en suite bedrooms and our sumptuous suite. The Commercial Hotel also holds fantastic daily events including Comedy Night on Tuesday, Jazz on Wednesdays, Soul on Thursdays and exceptional DJ's on Fridays and Saturdays. We believe we have something very, very special here at The Commercial Hotel in Chester making the hotel the perfect setting for drinking, dining, sleeping and dancing. The Commercial Hotel has won a number of awards including the Chester Civic Award for a beautiful restoration of a historic building and the 'Best Newcomer Award' at the 2010 'Chester Food and Drink Festival'. There are many City centre Hotels in Chester, but few with the history and quality of furnishing, imagination of design, and general atmosphere of relaxed, but attentive service. Our intention is to provide a home from home to all our guests, customers and new friends. A quintessentially traditional English Hotel, bar and restaurant with a contemporary but classic twist...a place for all types & tastes visiting the historic City of Chester! With nine en-suite rooms, the lovingly restored 19th century coaching inn promises to be a delightful experience. Relaxed and informal with a warm and welcoming atmosphere, the rooms offer a romantic blend of past and present. With a location right in the heart of Chester, situated next door to the architecturally acclaimed Town Hall and directly opposite to our fascinating Cathedral, the hotel makes a fine base from which to discover Chester or just to relax after a demanding business meeting. The Chester Crabwall Manor is a splendid country house hotel set in its own 11 acres of mature garden. Take the M6 to junction 20 and then join the M56 and follow to the end ignoring the turn off to Chester. The M56 ends at a roundabout follow signs for Queensferry and North Wales taking the A5117 to the next roundabout. Turn left onto the A540 towards Chester for about two miles. After approx. 1.5 miles you will pass a pub on left continue for about 1 4 of a mile and Crabwall Manor is set back on the right. Chester Crabwall Manor is a Grade 11 listed Manor House is set in 11 acres of its own grounds. With a history dating back to 1066. This Hotel is located just outside of the City of Chester. Gymnasium, Jacuzzi, Sauna, Steam Room. By Road, Leave the M6 at junction 20. Take the M56 for Chester and North Wales to the end then take the A5117 to Queensferry. Turn right at the first roundabout onto the A540 to Hoylake. The hotel should be 200 yards past the traffic lights on the left. By Rail Chester Station is approximately 15 minutes by car taxi By Air Manchester Airport is approximately 35 minutes by car taxi. Set among the beautifully tended lawns and gardens, Macdonald Craxton Wood Hotel Chester is 35 minutes from the airport and 15 minutes from the train station. The hotel is just ten minutes from the heart of Chester and five minutes from the shopping outlets. Local attractions include the Blue Planet, Albert Docks, Chester Zoo and several others. The hotel has 72 spacious guestrooms, all of which are comfortable, well furnished and equipped with modern amenities. Guests can dine at the onsite restaurant and enjoy a drink at the bar. Conference facilities are also available for business meets. Leisure facilities include a sauna, swimming pool and gymnasium. This Hotel has its own secure car park. A premier hotel in the heart of Chester city. From the North M6 Leave M6 at J20 onto M56 Leave M56 at J15 onto M53 Leave M53 at J12 onto A56 signposted Chester For more detailed directions contact hotel direct or visit our website From the South M6 Follow above route OR Leave M6 at J16 onto A500 signposted Nantwich Leave A500 at Nantwich onto A51 signposted Chester For more detailed directions contact hotel direct or visit our website. Our Hotel offers a range of facilities for guests including designated blue badge car parking, accessible entrance, Accessible WC, Accessible bedrooms, menus available in large print, induction loops. Rooms are accessible by Lifts from the Ground Floor. Crowne Plaza Chester is a four star rated hotel situated within the city's historic walls with views over the surrounding areas and the Welsh Hills. Chester itself offers a heady mix of historical attractions, superb shopping and a lively social scene. The Hotel is just a short drive from the M56 and close to many of the area's attractions including Chester Zoo, Cheshire Oaks, Blue Planet Aquarium. The hotel was fully refurbished in 2006 and now boasts brand new facilities throughout including an impressive club floor with 51 Club Bedrooms and a lounge for exclusive use, a stylish new lounge, bar and restaurant as well as a collection of professional conference and meeting rooms. All of this makes Crowne Plaza Chester the perfect place for your next conference, meeting or event. This Large Hotel is located in Chester City Centre behind the Market. Good Location for exploring the City. Located a few minutes walk from Chester Racecourse. The building dates from the 1880's. The Dene Hotel is a spacious AA Rated two Star Budget hotel located fifteen minutes walk and a few minutes drive outside central Chester along the main road from the motorway in the charming quiet suburb of Hoole. The Hotel has a large Car Park at the front and a bar/lounge area. Have a comfortable stay in Chester without breaking the bank. M53 TO A56 Junction 12 Signposted Chester. The Hotel is located one mile on the left. Doubletree by Hilton, Chester, (Formerly known as Hoole Hall), is just off the main route into Chester from the M53 motorway. Its excellent location places the hotel two miles from the centre of Chester and within easy reach of the M56 and M6 motorways, the cities of Manchester, Liverpool and Warrington, and a wealth of regional attractions. Exciting new developments are currently taking shape at the hotel including the full re-development of all guestrooms, plus the addition of impressive 4 new Junior suites, including a Presidential Suite. Our newly open 'Orchid Room', styled in White Leather, Walnut and Chocolate browns, with exquisite crystal chandeliers the tone of this lovely dining room has been described as 'New York chic meets Victoriana' with intimate seating booths, individual tables and floor to ceiling original bay windows overlooking the front lawn and fountain. Set in five acres of landscaped gardens, the hotel was designed in the 18th century. Only minutes from Chester City Centre and well placed for exploring the surrounding Cheshire countryside, the Doubletree by Hilton offers something for everyone. With Chester and Cheshire Oaks amazing shopping, the Blue Planet Aquarium and Chester Zoo on the doorstep, you will be spoilt for things to do. Ideally situated on the edge of the Roman City of Chester, located just off the A55 adjacent to Chester Business Park the Holiday Inn Chester South offers comfortable accommodation in an excellent location for both business and leisure visitors alike. Benefiting from immediate proximity to Chester and its attractions including The National Eisteddfod of Wales (3-11 August)Chester Races, Chester Cathedral, Chester Zoo, Cheshire Oaks Outlet Village, Blue Planet Aquarium and Delamere Forest Park. Holiday Inn Chester South provides an ideal visitor base, with a choice of accommodation including Standard, Executive and Accessible bedrooms. The Holiday Inn Chester South combines an excellent range of facilities for both Business and Leisure travellers including Kids Stay & Eat Free*. The hotel has full Leisure and Fitness, Restaurant and Bar serving food and drink throughout the day and 24 hour room service. The hotel also caters for Conference and Banqueting events for up to 120 people making it an ideal location for Training courses. The Spirit Health and Leisure club offers a gym and large indoor heated swimming pool. *Terms & Conditions apply. Please note that the hotel does not have a lift and the restaurant is located on the first floor. For assessable rooms types please contact the hotel direct. Full restaurant service and menu is available on the ground floor." Located on the Chester/North Wales border convenient for both the business or leisure traveller. The Holiday Inn A55 Chester West is situated on the A55 convenient for both Chester and North Wales, with excellent access to North Wales, Liverpool, Manchester, the Irish ferries and the motorway network. The hotel provides quality accommodation and value for money, with guest rooms of the standard you expect from Holiday Inn's world-wide. All rooms are en-suite with satellite television, WIFI in all areas of the hotel direct dial telephone, voicemail, modem point, hairdryer and tea/coffee making facilities. Our facilities are complimented by the Lounge Bar, Conservatory Restaurant(bookings must be made in advance), Mini-Gym ( not in use in the month of September)and free on site car parking. Brand new hotel being built. Opening 2019. The Feathers Group are proud to announce the opening of 87 deluxe new Kings Suites at the Queen Hotel in the Autumn of 2008. This £15million new development site will make the Queen Hotel the largest hotel in Chester and the largest Best Western hotel in the UK. The Kings' Suites at the Queen will offer stunning 5 star accommodation facilities with bedroom suites enjoying individually designed themed bedrooms, free wireless and wired internet access, full entertainment system including satellite television CD and iPod players, oversized bedrooms and bathrooms, power showers, 24 hour deluxe room service and many more truly memorable added extras to make for a quite unforgettable stay. In addition the Kings at the Queen offers the "Kings' Quarters" - a VIP executive club bar and lounge on the ground floor, a chic new place to enjoy early evening drinks, cool cocktails, light snacks and is guaranteed to be the happening place in Chester. Be personally escorted to your individually named and themed Kings Suite with each floor devoted to a set of Kings from around the world with a Penthouse floor of aptly named emperors. These new designer led facilities located as part of the current Queen Hotel site enjoys the best of both worlds as our clients can also benefit from the existing Queen Hotel bars restaurants and award winning service. New Ground Floor Restaurant and Bar. Book a Kings Suite at the Queen now and be treated as a King! This Hotel is located on Hoole Road just outside the City of Chester. 20 Minutes walk approx to City Centre. A warm welcome awaits you at The Limes, which is under the personal supervision of the resident proprietors, Howard and Christine Braydon. English Tourism Council Best Bed & Breakfast in NorthWest 2002 Silver Award. Winner of Hoole in Bloom 2002. Silver Award Chester in Bloom 2002. We are less than a mile from the historic City centre of Chester, with ample car parking in our private car park. Buses pass the door, and the Railway Station is half a mile away. Welcome to Lloyds of Chester Hotel, a boutique family owned and run hotel, conveniently located near the train station in the heart of the historic city of Chester. We believe in the personal touch and as Lloyds has been owned by the same family for over twenty years we have plenty of experience and knowledge of Chester and the surrounding area that we will be only too happy to share with you. At Lloyds our philosophy is simple we provide a high standard of service and accommodation at an affordable price in a city centre location. 5 Minutes walk to the City Centre. Directions for the Mill Hotel from the M53. Exit the M53 at Junction 12. Turn Right at the roundabout A56 . Carry straight on to the next roundabout. At the roundabout go straight ahead A56 . Remain on the A56 Hoole Road for approximately one and a half miles until you reach the next roundabout take the first left exit A5268 . Take the 1st left into Seller Street. 2nd left into Milton Street . From Wrexham Carry on into Chester on the A483 Go over the Grosvenor Bridge over the River Dee the Race Course is just visible on your left. At the next Roundabout take the left exit onto the A5268 Go over the 1st Roundabout B Q is on your left . Go over the 2nd Roundabout. The Mill is 50 meters on your left. Take the 1st Left into Seller Street and the 2nd Left into Milton Street. A jewel in the centre of the Roman City of Chester. The original Griffith's Corn Mill was built circa 1830. The latest extension was completed in 2001. The Mill Hotel is located just outside the main shopping area of the centre of Chester on the Shropshire Union Canal. From M56 J16 To Chester on A540 and hotel is 2 miles on right after signs for Mollington Village. From Chester follow signs for A540 to M56 hotel is on left 1.5 miles from edge of City. The entrance to the Hotel is on a 50 Miles Per Hour Road with no Street Lighting. It is easy to miss and the AA Sign is located past the entrance. Mollington Banastre Hotel is situated in 8 acres of delightful grounds and gardens 2 miles from the centre of Chester. It has a superb leisure centre and caters for all the family as well as conferences and corporate guests. Please note children under 14 years of age are not allowed in the pool after 6.30pm. To avoid disappointment please make your dinner reservations as soon as possible. Moxy Hotel has submitted an application for a 194-bedroom Moxy hotel at the former Boughton retail centre in central Chester, a project that will complete development at the site. Boughton saw Waitrose open a store in 2014. 24 on site car parking spaces. From the North South M6 M60 M61 all to the M56. M56 to Wales exit junction 15 M53 Chester Wrexham. M53 Chester Wrexham exit junction 12 A56 Chester. Take the 3rd exit off the roundabout towards Chester City Centre. Along the dual carriageway over the roundabout brown sign Hoole Road Hotels . A56 into Chester 1 2 mile down Hoole Road we are situated on the left hand side. The Oaklands a traditional local pub with Live Entertainment and Big Sports Screen. Its a popular venue on the Hoole Road between Newton and Chester. Serving food from 12pm 9pm. Near to many local attractions including Chester Zoo Chester Cathedral Chester Roman Walls Blue Planet Aquarium The Welsh Border and numerous walking paths. Also perfect for shopping Chester City Centre and Europe's largest outdoor retail outlet Cheshire Oaks. This Hotel/Pub is located just outside the city of Chester. 20 Minutes approx walk to the City Centre. Oddfellows on Chester’s Lower Bridge Street is a spectacular 17th Century Georgian manor house which has been renovated to give it back its character and grandeur; and some. To the rear there’s a fantastic garden area with four Bedouin tents that can be hired for any occasion and lots of tables for both eating and drinking alfresco within the phenomenal walled garden. Inside, the splendiferousness continues with private dining rooms including an Alice in Wonderland themed room that is perfect for Afternoon Tea, two restaurants depending on your choice of menu. There is the funky Pantry which is on street level where Afternoon Tea, an All Day Menu or a relaxing coffee or breakfast can be enjoyed. If you are looking for a little luxury there is the comfortable & stylish Brasserie where an Al a Carte menu can be served designed by Michelin Starred chef Richard Phillips. The Champagne bar offers a late license and has an extensive cocktail menu, if drinks were art, then Oddfellows would be the national gallery. The Bar Tenders would argue that drinks are in fact art or at least they are the way they do them as they are artists in their own right. As well as being highly trained, their understanding of drinks is instinctive. They sculpt, they define, they experiment, they create. Their materials are the best; the right ice, the right glasses, the right ingredients and all at the right temperature, taste perfection! With regard to music there is a resident DJ during weekends & Live Music on Thursday & Sundays from various acoustic artists and a great dance floor to dance the night away. If you are looking for a Hotel, Oddfellows has four very individual hotel rooms which are situated in the old servants’ quarters and must be seen to be believed each with its own unique charm and exquisite finishing touches. Oddfellows is a place for eating, meeting, fine dining, champagne sipping, cocktail shaking, afternoon teaing, dancing and sleeping. Everything is designed to make the usual unusual; the ordinary extraordinary. Décor veers from gracious sophistication to dramatic intensity. Nothing matches, but everything makes complete sense. Oddfellows Chester Dine. Drink. Dream! Junction 5 of the M53 at the roundabout follow signs for Queensferry. Proceed across the first set of traffic lights and at the 2nd set turn right onto the A550. The hotel is 1 mile on the left. From Chester take the A41 towards Birkenhead. Turn left at the first set of traffic lights in Little Sutton by Barclays Bank into Ledsham Road B5463. At T junction turn right and the Hotel is on the left hand side. Formerly known as The Quality Hotel, the Woodhey House Hotel is a modern hotel located outside the City of Chester on the Wirral on the way to Birkenhead. The Queen Hotel is one of Chester's premier hotels for comfort. This elagant AA four star hotel is located opposite Chester Railway Station and a twelve minute walk to the historic centre of Chester. Small Private Car Park to the rear of the building, access via Duke Street. Built in the Georgian era, Recorder House retains the atmosphere charm of a bygone age. Set on the ancient city walls and overlooking the River Dee, it is a tranquil haven, only a short walk to all amenities in the centre of the medieval city of Chester. Rossett Hall is an comforable elegant period Georgian hotel situated on the old Chester to Wrexham road about ten miles to the west of Chester. Welcome to Roomzzz. Combining the style of a boutique hotel with the convenience of a serviced apartment, our aim is simple: To give you more of the things you want, less of the things you don't. Each apartment has its own kitchen. Food can be purchased in the pantry next to reception. New hotel located within the ancient city walls near the racecourse just off the junction of Watergate Street and Nicolas Street. This country house hotel is set in the green fields on the edge of the city of Chester about two and a half miles away. This four star hotel offers a comfortable stay with spa facilities. Quarterz of Chester is Located in the heart of Chester. Quarterz is a new city center hotel that boasts 36 en suite bedrooms. Free view Tv is availble in all rooms. Hypo allergenic beds throughout with Free Wi Fi connection throughout the whole hotel Chester train station is located just 3 minutes walk from the hotel, and we are located just a 2 - 3 minute walk from the city centre. A security deposit is pre-authorized on your card on arrival. This deposit is fully refundable upon check-out and subject to a damage inspection of the accommodation. De Vere St. David's Park Hotel is a luxury four star hotel located eleven miles or twenty minutes drive from the city of Chester. The perfect location for business, golf or leisure. This new modern budget travel hotel is located next to the city walls and amphitheatre in the historic centre of Chester. Perfect for a cheap city break and to explore Chester's history. Also the River Dee, Groves and boat rides are available just down the hill at the end of Souters Lane. This well established three star classic hotel is located across the road from Chester Railway station and about a ten minute walk into the main historic shopping streets of Chester. Want to stay outside of Chester in the Cheshire Countryside ? Here at the George & Dragon we are very proud of our six boutique en suite bedrooms. All finished to the highest standard and boast the latest LCD TV with built in Freeview, Power Shower, Tea/Coffee making facilities and Wireless Broadband. Visiting Chester for the Day ? Want somewhere to leave your luggage while you look around ? Chester Backpackers Youth Hostel will look after your luggage for the day with advanced notice.